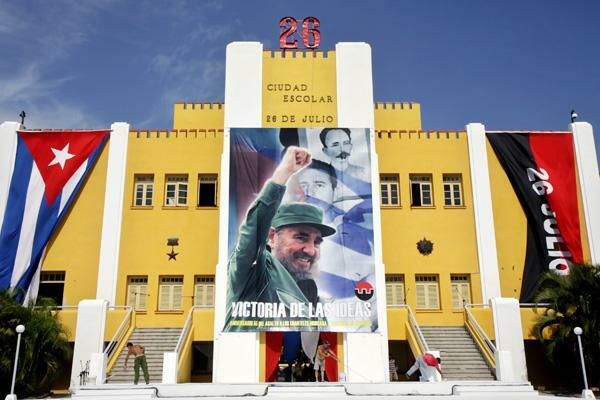 We, the International League of Peoples’ Struggle, join the Cuban people and all other peoples celebrating the 60th anniversary of the attacks on the Moncada barracks and the nearby Bayamo garrison on 26 July 1953. The attacks were carried out by some 160 men and women led by Fidel Castro and Abel Santamaria. The daring actions failed, with dozens of the rebels murdered and jailed after torture. But they inspired the waging of a revolutionary war led by the July 26th Movement. This culminated in the popular insurrection which overthrew the US-supported Batista dictatorship on 1 January 1959. The Cuban toiling masses of workers and peasants dismantled the state power of the ruling classes of big compradors, landlords and bureaucrat capitalists and established a democratic government. Since then, the Cuban people have upheld national independence and socialist revolution against the economic, political, military and other forms of attacks by US imperialism and its puppets. We stand in solidarity with the Cuban people and support them in their revolutionary struggle for national independence and socialism. We applaud them for standing their ground against the nearby imperialist power, advancing the cause of national and social liberation and thus inspiring the oppressed and exploited peoples to fight for national independence, democracy and socialism. Long live the revolutionary spirit of the July 26 Movement! Long live the Cuban people and Cuban revolution! Long live international solidarity against imperialism and all reaction!